Bernstein insists on a poetics attuned to the echoes of others’ voices and to the power structures that inevitably shape our own voices, even when we call for revolutionary change. 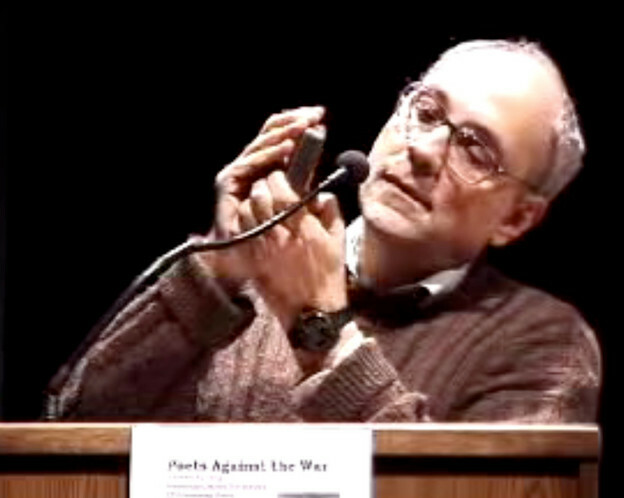 He therefore criticized aspects of the Poets Against the War move­ment (founded in response to the US invasion of Iraq) and called in­stead for, in his words, “an approach to politics, as much as to poetry, that doesn’t feel compelled to repress ambiguity or complexity nor to substitute the righteous monologue for a skeptic’s dialogue.” While criticizing poetry and political statements not self-consciously aware of their echoes, Bernstein mobilized the very rhetorical moves that he claimed to be undermining, provoking attacks from other writers. Kent Johnson described Bernstein’s “moral decree” as being “astonishingly blind to the ironies of its own arro­gance,” while David Baptiste-Chirot compared Bernstein to George Bush: both, wrote Chirot, ask their “listeners to make a choice—you’re either with us or against us.” Yet such suspicious readings are entirely to the point—they are what Bernstein’s texts repeatedly demand. By performatively echoing the rhetorical modes he claims to oppose, Bernstein destabilizes their certainties and points to their complic­ity. Whether Bernstein perpetuates or dismantles the structures or frames of thinking he puts into play is left in doubt. This is where I would locate Bernstein’s poetics of iteration as, in another sense, a poetics of revolution. Bernstein has written about his use of irony as perpetual circulation or exchange: “With irony, you’re left with some sense of authoritative distance from whatever’s being mocked or ironized, es­pecially in the modernist form. I’m interested in coming back around so that you’re actually where you were if it wasn’t ironic. You’ve gone through this humorous turn, but it’s self-cancelling in the sense that you’re not remaining at a distance from it, nor are you ridiculing it. On the contrary, you’ve gone through a kind of comic spin cy­cle.” Bernstein’s “comic spin cycle” presents the poetics of revolution as a poetics of iteration. To follow Bernstein’s incessant motion at a high rate of revolutions per minute is to experience the entrapping, implicated position of poem, writer, and critic within the global circulation of capital and the uneven structures of modernity, modern art, and global power. Yet like Brathwaite’s “tidalectics,” Bernstein’s “spin cycle” also seeks to dis­arm these entrapping forces. Brathwaite disarms dialectical thought (which he calls “an­other gun: a missile”) by transforming it into “tidalectics”: a circle that “moves outward from the centre to circumference and back again.” Bernstein attempts something similar with his “spin cycle”—an image of everyday domesticity with a touch of comedy. Instead of a revolutionary resolution of oppositions, we are left with just another revolution of the washing machine, or, if we listen closely, of a turntable whose revolutions are marked by the perpetual dissonance of the skipping needle.